In the last decade or so, India has witnessed a surge in the number of literary festivals. Formerly, it was felt to be sufficient when each larger city had its annual Book Fair. They exist basically for readers to get their supply of new books for a whole year as the availability of books is still woefully inadequate in this country. Getting a book which is not stocked in the bookshop remains an unreliable and lengthy process. If you opt for an e-commerce site you deprive bookshops of their earnings. By now, every metropolis, including Kolkata, wants to shine with a “Litfest”. This is not only a giant bookstore like all book fairs, but it is meant to create a space in which public encounters with authors take place. The authors read from their books and are “in conversation with” interlocutors and critics and take questions from the audience. This brings readers closer to reading books and to understanding and enjoying them. Indeed, in many cases it is stimulating to listen to authors reading from their works. But strictly speaking, books are meant to be read by ourselves, alone. Every activity beyond this may generate more appreciative readers, but it also takes readers away from their primal activity which is reading. By the authors’ recitation, a text may become more transparent, more luminous, but often the reverse does happen as well: A recitation turns listeners away from a book. Both reactions may have no reflection on the literary value of a book. It is the voice, the body language, the personality and the magic a writer is able to conjure (or not) which are responsible for the immediate impression on listeners. Again, it is independent from the quality of the book. Further, it is positively dangerous when authors begin to interpret their own work while “in conversation” and when they take questions. Authors speak through their writing. If they have to interpret and explain it, it means their texts are in some way deficient; something needs to be added to unfold their full meaning. At Litfests beware: authors are known to interpret their works ad nauseam. Interpretations by readers and students of literature are, however, justified. Each literary text is ambivalent and can have different layers of meaning. It renders itself to various interpretations some of which even the authors are not aware. Once written and published, books assume a life of their own in the public sphere. They are no longer the authors’ possession. 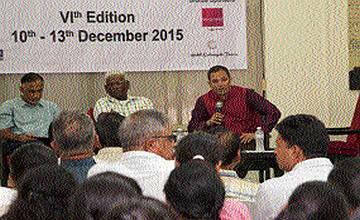 In mid-December, I visited my first Litfest, the Goa Arts and Literature Festival. I went to introduce my latest Tagore book to the public, Rabindranath Tagore: One Hundred Years of Global Reception (Orient BlackSwan, edited with Imre Bangha). It was a great experience. Authors and critics arrived who I had met before, others who I respected and had ever wanted to listen to; now I could do so. I had discussions with Harsh Mander, Keki Daruwallah, Meena Alexander, P. Sivakami, Antara Dev Sen and a host of others. Early on, one writer whose articles I admire, was being interviewed. He accentuated his tempestuous eloquence by an equally tempestuous waving of his arms. He spluttered and stuttered, slurring his words and jamming them together, he often stopped in mid-sentence to start another. With embarrassed surprise I compared this performance with his disciplined, carefully crafted articles. I knew that henceforth I would read his articles with diminished joy, all the while seeing his mannerisms in front of my inner eye. I do enjoy knowing how writers live. What is their life-story, their family background, why and how did they discover their vocation as writers. All this is of huge interest to me because I am interested in people and also because I study how other writers cope with our professional challenges. A Litfest indulges in disseminating and gathering such tidbits of knowledge. It is the personal touch which makes a Litfest attractive. Such stories and anecdotes do enliven literature, but at the same time they take away from its gravity and mystique. Authors are to be read, not heard. This must be so although many freelance writers in India as well as in Europe earn their livelihood with honoraria received from book-readings, interviews, seminars, lectures, and media-appearances. I am one of them. But I try to keep the writer and the speaker in me separate. As much as I enjoyed the Goa Litfest, amidst its atmosphere of bonhomie and conviviality, I felt the undercurrents of writerly vanity, jealousy and competitiveness. This should not have come as a surprise to me. Some authors know no other subject than themselves and their books. There is busy networking, catching the eye of a publisher, spouting sound bites to project one’s book. There is limited time to do all this: If some publisher approaches you with a big “Hi”, you get thirty seconds to make an impression on him. Even the conversation sessions often boil down to advertising your book, securing its sale and discussing future book projects. Do we authors become our own advertisement agents? In Europe, too, book readings are a relatively recent phenomenon. It is basically an effort to catapult literature into the centre of social life Rs into the market-place of life. This is laudable and deserves support as long as we understand that this is not “the real thing”. In Europe especially where loneliness is rampant, public performances of literature are yet another method of giving meaning and human connectivity to our life which otherwise is dominated by a quasi-anonymous digital communication. After my initiation into litfesting in Goa, will I accept some future invitations? Yes, I will. But I am forewarned at what attitude to take.